O2COOL's ArcticSqueeze is the perfect drinking bottle for your bike, sporting or outdoor activity. This product is flexible, easy to squeeze and provides you with a high flow rate of water and a fine mist to cool you down. Its insulated design keeps your water colder longer. The new "Splash" pattern ArcticSqueeze come in a great assortment of colors that look great and work hard to keep you cooler and more comfortable during the hot Summer months. 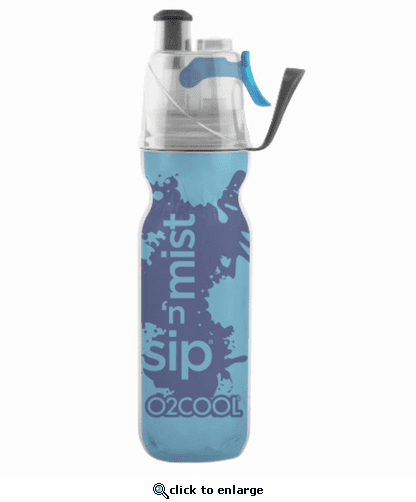 O2COOL�s patented Mist 'N Sip products provide a unique combination all in one - Misting and Drinking. The mist feature helps to cool you down on the outside while you stay hydrated on the inside. We offer a wide selection of different drinking and bottle options to quench your fitness and outdoor thirst.